Its been a while since Ive posted pictures of our latest decking design and build projects, due to having been so busy. So heres a selection of some of our latest jobs, mainly decks, balconies and stair cases around Wales. A little bit different to our usual House or Caravan decks. This rustic deck was bit around a converted railway carriage high above the Dyfi valley. Its also available for short breaks, I'll add a link soon. The previous staircase to this tree top deck had been built 'badly' and had started to rot due to non treated timber being used, we ripped it down and replaced it with this treated pine staircase and central platform. each step is 150 x 300 mm, creating a very easy to use staircase. Wanting to incorporate some privacy panels, we stick to using our familiar post and rails railing methods but replace the balustrades with feather edge panels to add privacy. As can be seen on the side we raised the panels to 6 foot to add a total barrier. The solid panels also cuts down wind chill on windy days, ideal for coastal locations. We don't mess about with our decking construction. We generally use 6x2", (150x50mm), joists at C24 grade for our beams and joists. Our frames are built using the post and beam method to evenly distribute weight across the footings. The weather is starting to turn now, but we keep working all year round, designing and creating timber decks and balconies for our clients. Although people tend to think that spring and summer is the best time of year to get a deck added to their property, we're happy to work through Autumn and winter. Also if the decking means altering your garden in anyway, it allows time for your garden to recover before spring arrives. Garden Carpentry timber decking,UK. We specialise in building Decking in Wales, and other outdoor wood work, carpentry, and garden design. Please take a look through our gallery's to view balconies, stair cases, out door furniture, hardwood decking, decking lights and more. 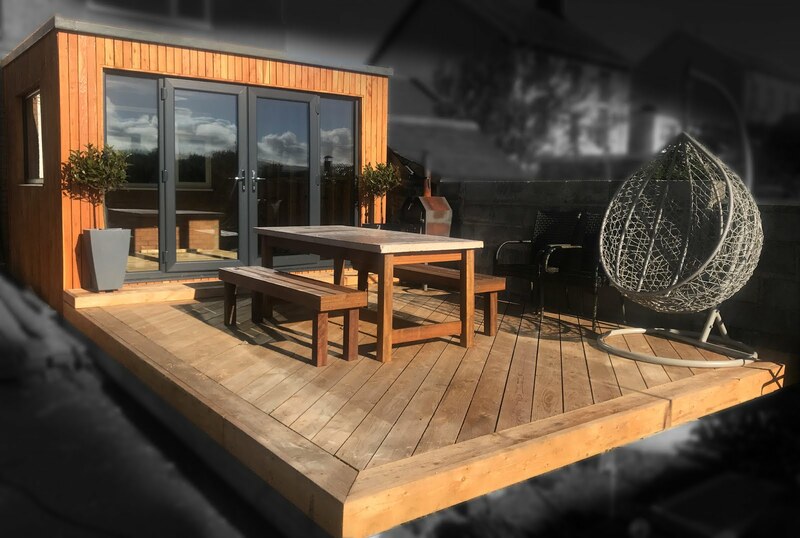 We offer a full design and build service, and have been specialists in timber decking installation in the UK for over 15 years. Please call us for a free no obligation quote on your own design or have us design a custom deck for your needs and budget. 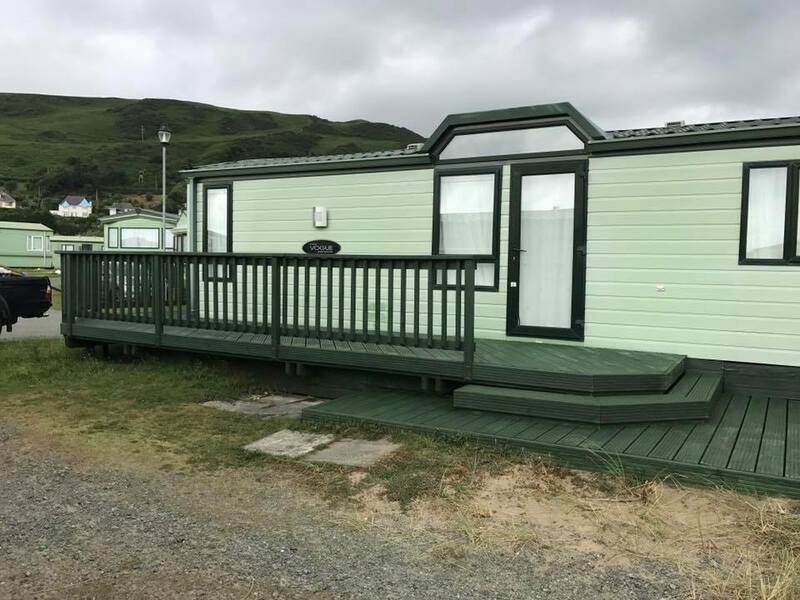 When it comes to decking on homes or caravan decking there are various options which can alter the style, longevity and cost of your new decking. For the majority of our timber decking here in Wales, we use a square balustrade style rail, which is both planed and treated with eased edges to produce a bespoke and long lasting railing. 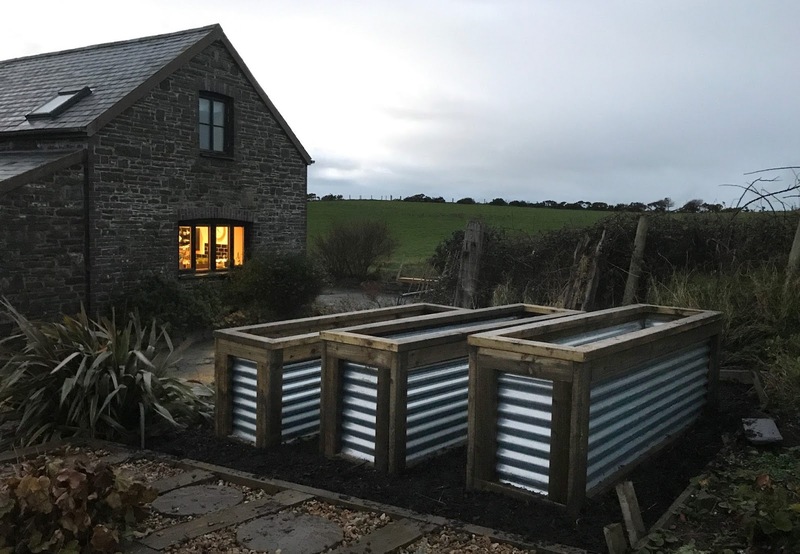 A flat capping rail gives a sturdy and rustic finish, and also double well as some where to rest a pint glass or glass of wine during BBQ's or just when relaxing in your garden enjoying summer evening. All the other timber used in our decks is also treated and finished to an especially high standard. All metal fixings are either galvanised or salt spray tested with an organic coating to ensure resistance from salt water and any other form of corrosion. No timber ever touches the floor in our decks due to our bolted in or concreted in base brackets, yet again ensuring our decks will out last others! The majority of our decks are used building treated soft woods, but we also use hard woods and locally grown softwoods, that can offer a long lasting alternative to imported and treated softwoods. Larch and Cedar is available from a local timber source here in the Dyfi Valley, for local timber supplies here in Machynlleth, please follow the link. We have various examples of work using a range of timbers, please ask if you would like to see a specific example. Plastic or composite is another option that we can use in our decks and have done so previously on caravan and home decks.